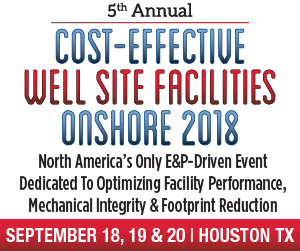 After carrying rigorous research with dozens of operators across North America, and keeping the industry’s immediate priorities in mind, American Business Conference’s highly acclaimed Cost-Effective Well Site Facilities Onshore returns to Houston in September for its fifth consecutive year – bigger and better than all previous years. This is North America’s Only E&P-Driven Event Dedicated To Optimizing Facility Performance, Mechanical Integrity & Footprint Reduction. Facility Performance, Mechanical Integrity & Footprint Reduction.